caitlin richards and i made a beautiful baby together, and we also love creating radio shows as a team! you may have noticed that i haven't been on the air as much as usual lately, and that's certainly been the case for caitlin as well. 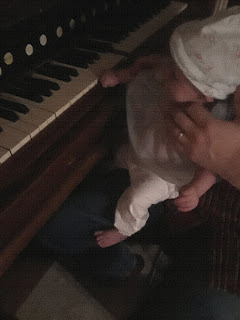 we thought it would be fitting to make our returns to the airwaves together with a special collaborative program entitled imaginary organists: at home with the baby vampire bat. you can hear it on june 5 at 8 pm and again on june 6 at 1 pm on cjsr fm 88.5.
from now on, just like the good old days, you can catch new editions of caitlin's imaginary landscapes each tuesday evening, and my show every wednesday afternoon.